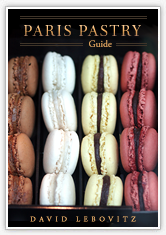 There’s a nifty guidebook to the bakeries, chocolate shops, and tea salons, called The Pâtisseries of Paris. This handy little book is full of great addresses and tips, and is just small enough to slip in your shoulder bag when hitting the streets of Paris, should you come to Paris on a mission for sweets. I was surprised at how in-depth this guide takes you. Naturally, the usual suspects, like Ladurée and Stohrer, are in there. And chocolatiers like Jean-Charles Rochoux and Patrick Roger are always a stop whenever I’m on the Left Bank, so I was happy to see the nods toward them. There’s few places that aren’t quite worth the calories. Such as Au Panetier bakery, where the pastries don’t make up for the glorious art nouveau tile work, although it is gorgeous. Happily, some of my favorite bread bakers, like du Pains et des Idées and la boulangerie par Véronique Mauclerc, that aren’t so well-known, are listed. Other highlights include an interview with the candy buyer at Fauchon, a list of which museums have the best pastries (only in Paris! ), and profiles of off-beat places like A Priore Thé, where you can dine almost al fresco in the stunning Galleries Vivienne, where desserts are available in half-portions, should you just want a taste. Packed with lots of delectable color photos by long-time Paris resident Allison Harris, I recommend The Pâtisseries of Paris to anyone dashing in to town, looking to explore the best of the city—from a pastry perspective. I was writing an article about this book when I thought it was time to check my feeds. And here is what I’ve found. I had to read this post with my head turned away from the screen so that I could get the info but avoid the temptation to gorge myself on French pastries. No luck! I’ve lost 5 lbs this week and my pride in my accomplishment is the only thing that is keeping me from running to the nearest bakery for an armful of millefeuille. That and the fact that we can’t get a decent millefeuille here in the suburbs of Toronto! Sounds like a good little book. When I’m thin and deserving I plan to buy it and a plane ticket to Paris. sounds like it’s time for me to grab one of this! i will be in town in just a couple of months, hurray! Many thanks for mentioning this book. 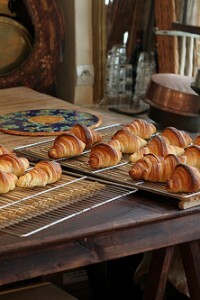 I am always looking for additional info to help me in my ongoing search of patisseries when in Paris. David, are there any recipes in the book? Estelle: There aren’t any recipes, since I think it’s meant as a guidebook that you’d want to take along with you on a trip. Steve: Prices in Paris, as you know, have always been high. There has never been any 3€ chickens here (although there’s plenty of 3€ wine! ), so people are used to paying more than they do in the states for things. But food in general has increased 30-50% in the past few months. I haven’t noticed a spike in bread prices. Vendors tell me this biggest costs have to do with oil. For bakeries, even though some of the ingredients are expensive (like chocolate and nuts), their biggest cost is always going to be labor. I just headed over to Amazon and ordered this. Not one to ever pass on free shipping, I also added Clotilde’s Edible Adventures and another book that looks interesting – Chic Shopping Paris, to my cart. I don’t know when I’ll get back to Paris but when I do, I’ll be prepared. I’m hoping to profile her book on the site at some point in the near future, and see if I can get her to let me take a photo of her chowing down on and éclair au chocolat or something to share! You have given such good ideas/great advice over the years – will be in St Remy de Provence the first week of May. Anything not to miss? Be sure to visit Lilamand as well as Joel Durand for chocolates-his site is listed is on my Links page. Both are amazing! Also, thanks, David. We’ll be in Provence in October. I just bought it from Amazon. I know I get into trouble every time I come to a blog that has a book recommendation. Like Veron, I just ordered it from Amazon. Along with the new one from Patricia and Walter Wells. My husband says I have enough books on France and Paris to finance another trip. As a recent convert to your blog, I have spent the better part of the past week reading your archives, sharing your frustration with French bureaucracy, drooling over every close-up of sweet savory sticky crunchy spicy salty chocolately goodness that graces your blog all while snacking on everything in my refrigerator and cupboard after sprinkling with sea salt, alas no fleur de sel. I finished a can of aerosolized cream made somewhat palatable with a small sprinkling of said sea salt (who woulda thunk salt on whipped cream?) all because I couldn’t tear myself away to get proper cream. I have gained 5 pounds and can’t fit into my “thin” clothes anymore. Keep up the fabulous work. Mimi: Walter Wells is an amazing, and very interesting man. One of the nicest people I’ve ever met. I bet the book will be a terrific read. Merriam: Gerard Mulot on the rue de Seine is closed on Wednesday, which throws a lot of visitors off. Luckily it seems like you got your fill anyways! Ann (and all): I’ve categorized most of the places in Paris in the left sidebar here on the site, so visitors can find what they’re looking for. I’m also in the process of updating the My Paris page, which will have lots more suggestions and info. i try to approach every city i visit from a pastry perspective. Oui, let’s go to the Paris! Thank you for this info, people who don’t know this “tips and tricks” can miss the best of food in that place. I’m planning my first Europe trip and have just taken note of the guide. Is there anywhere else you recommend? My copy just arrived yesterday and I’ve already gained 10 pounds just looking at the pictures.